Ideally, you never get to see one, but if you live in Mesa, AZ, chances are that sooner or later a scorpion is going to cross your path-or living room floor. Either way, you are going to be anything but excited and may feel disgusted or even scared. And while your initial reaction may be to go ahead and take care of the scorpion problem by burning down the house, you should take a step back and evaluate what other options of scorpion control are available to you. Plus, how much do you really know about scorpions? The best way to combat scorpions is to understand exactly what you are dealing with. Why does this matter? Because if you don’t know and understand the creature, you cannot effectively combat it and get rid of it. The striped-tail scorpion is, according to the Desert Museum, the most common scorpion in Arizona. It can be found virtually anywhere from the desert to the mountains, sea level and beyond. It gets its name from the distinct dark ridges on the underside of its tail. It measures about 2 inches in length and likes to hide under rocks during the day like most Mesa scorpions do. One of the less common scorpions in the Mesa area is the giant desert hairy scorpion. While it is an active and aggressive scorpion, its venom is not very potent and thus it is not really big on our scorpion watch list. The Arizona Bark Scorpion is one of the most common scorpions in Mesa and surrounding areas. Unfortunately, it is only the most dangerous one and the only species that is willing to climb walls and trees, making it a frequent visitor in your home. And because they like to be upside down, people often get stung from a scorpion that is on the bottom of something. What makes them so hard to eradicate is that they can live comfortably in almost any condition. The fat on their exoskeleton makes the almost immune to moisture loss, which is why they can live in the desert, but also sustain in freezing temperatures. Its venom can cause serious pain, numbness, tingling and the effects last about 24-72 hours and while it is not generally fatal, it can be in children, elderly and those with compromised immune system. Bark scorpions reproduce about four times a year and have about 30 young every time, that is a serious amount of scorpions that are being born into your Mesa neighborhood on an annual basis. Bark scorpions like to feed on small insects such as termites, crickets, roaches, spiders, ants and other similar pests. This means there is a lot of food around for a scorpion to feel at home in or near your home. There are several ways to get rid of scorpions and prevent them from coming back. Eliminate the Food Source: This is a common approach to Mesa scorpion control. The theory is that by getting rid of ants and other pests that attract scorpions, you discourage them from coming back. The problem with this is that while scorpions will have to eat eventually, the bark scorpion can in fact last for six months without food or water? There is no way to make sure that there aren’t any ants for six months in your home and even if you could, scorpions will always find food, even if they have to eat each other. While the food elimination source approach might minimize the odds of scorpions, it cannot cure an existing scorpion problem. Eliminating Hiding Spots: You can reduce the odds of scorpions hiding and housing in your Mesa home. Get rid of piles of leaves, empty boxes, decaying wood, and rock piles. Because scorpions are nocturnal, this will greatly reduce spots they can hide. Pay close attention to stuff that accumulates close to your home. Check for cracks and open areas around cables and pipes as they are common ways for scorpions to get into your home. Cracks on your foundation as well as door frames and windows are also invitations for scorpions to come and join you. Be careful: That goes without saying, but what does it mean? Don’t bring items inside without inspecting them first. DIY Scorpion Control: While your local scorpion pest control professional will probably not generally encourage you to take of a scorpion infestation on your own, there are certain things you may want to try. We recommend deltamethrin granules. These granules work great for controlling scorpions and though they may take a bit longer to work than you may like, they are non-toxic to humans and pets which is an important consideration if you have pets and small children. If you are looking for something that works faster and is more potent, you could try spraying with Cykik CS. However, it can be harmful to pets and humans and you should wait for the solution to try before you venture outside again. If you use both in conjunction with removing hiding spots from your Mesa property, you have a decent stepping stone to controlling your scorpion population. Professional Scorpion Control Services: This, of course, is the best thing you can do and we don’t just say that because that’s what we do. To efficiently and permanently get rid of scorpions you need to have a thorough understanding of the creature’s life cycle and its habitat. 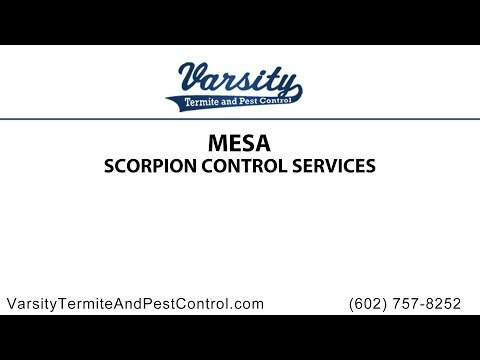 An experienced Mesa scorpion exterminator can also devise a regular scorpion control maintenance schedule, which ensures that there is no lapse in treatment. Doing it on your own, many residents do it on an as needed basis, which may negate any effort previously taking to get rid of those creatures. Varsity has been proudly providing scorpion and pest removal and control services to homes and business in and around Mesa for years. Our proven scorpion carrier system is guaranteed to work. To learn more about Mesa scorpions in Zip Code 85203 and other areas and how to get rid of them or to schedule a service visit contact us today.